"Neck bones are great with greens or cabbage. They can be baked or boiled, this recipe can be fixed either way. It depends upon how much attention you want to give the dish. I think this is one of this meals that takes you back to your mother's kitchen." Sprinkle 3/4 of the onion and garlic into the bottom of a roasting pan; pour in the vinegar and water. Season the neck bones with salt and pepper and place into the roasting pan. Sprinkle the remaining onion and garlic over the neck bones; cover the roasting pan tightly with aluminum foil. Bake in the preheated oven for 2 hours, basting every 30 minutes. Be sure to recover the foil every time you baste. After 2 hours, remove the foil and continue baking until the neck bones are golden brown, about 45 minutes. A recipe for perfectly crispy, double-dredged fried chicken. mmmmmmmmmmmm....Yummy...Just like my grandmother used to make. Very tender, very flavorable. 1st time cooking neckbones & new to cooking. Found this receipe easy to follow, quick, & food came out fantastic! Will be cooking again! This is a simple recipe! I put mine in the oven for 2 1/2 hours.. Came out very tender and flavorful..
Great dish from Keryne as usual.. 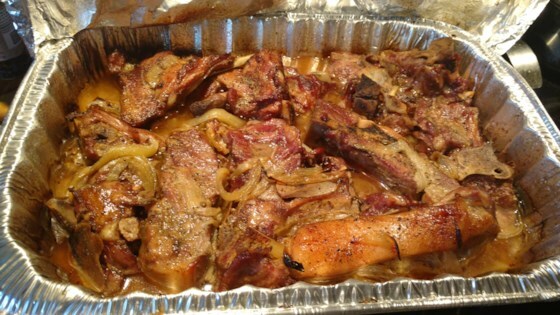 I prefer boiled neck bones but hubby likes them baked just like this... thanks Keryne!! Taste just like the South!!! Add a little cayenne, green onions and a piece or two of bell pepper for the "Slap Yo' Mama" Louisiana flair!